A college hoops trend will continue this year as Nike has once again dominated both of the NCAA Tournament&apos;s Final Four fields. Nike sponsors each of the eight teams that make up the men&apos;s and women&apos;s Final Four, both of which take place this weekend and will see Villanova vs. Oklahoma and Syracuse vs. North Carolina on the men&apos;s side and Connecticut vs. Oregon State and Syracuse vs. Washington in the women&apos;s tourney. 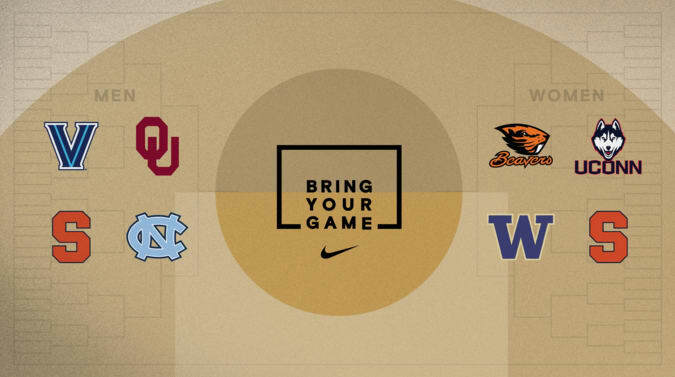 To give this some historical perspective, according to Nike, the brand has sponsored almost 80 percent of men&apos;s and women&apos;s Division 1 Final Four squads over the last decade. Furthermore, 11 of the men&apos;s and women&apos;s Final Four groups since 2001 have been all-Nike teams. For the 2016 tournament as a whole, Nike had 69 percent of the 68 men&apos;s teams and 58 percent of the women&apos;s.
No matter who ends up cutting the nets down this year, it&apos;ll be a Nike school, marking the brand&apos;s 16th men&apos;s and 13th women&apos;s NCAA championships.